PsyCalc® for the Palm is Here! Linric Company announces release of PsyCalc® for the Palm. Now you can have the most powerful psychrometric tool available to you anytime, anywhere. 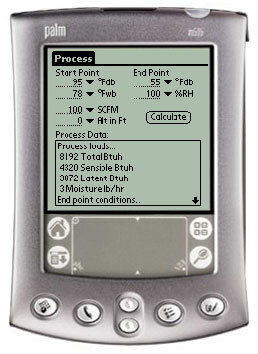 And PsyCalc® for the Palm has a new PsyCalc® feature, the process screen. Calculate the total, sensible, latent and moisture loads of any process right in the palm of your hand! English (IP) and/or SI units, with defaults saved. PsyCalc® (properties), Mixing and Process screens. Dry bulb range -80 to 400°F. Dew Point range -80 to 200°F. All outputs conveniently displayed in list box. The ease and accuracy of the most popular psychrometric tool available. We have taken the PsyCalc® calculation engine and programmed it exactly for the Palm. No shortcuts, no variances. Then we build a Palm-based interface that mimics the award-winning PC version of PsyCalc®. We run the program through it's paces, deployed three beta versions for test and evaluation. We are so sure that you'll be impressed and want to keep a copy that we are offering a 60 day money back guarranty. If you do not want PsyCalc® for the Palm for any reason just email us your reason within 60 days of purchase and we'll refund the purchase price. 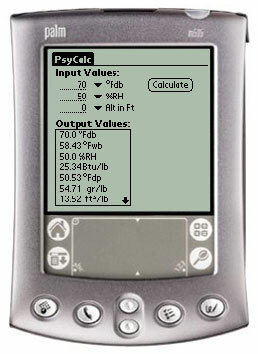 To Order PsyCalc® for the Palm go to the products page. Are you using PsyCalc® 98 on your PC? If not why not try the 30 demo. Click HERE to go to the download page.